A Swedish family’s skiing trip seems to be going just fine: Apart from a little whining from the kids, all appear to be enjoying themselves. 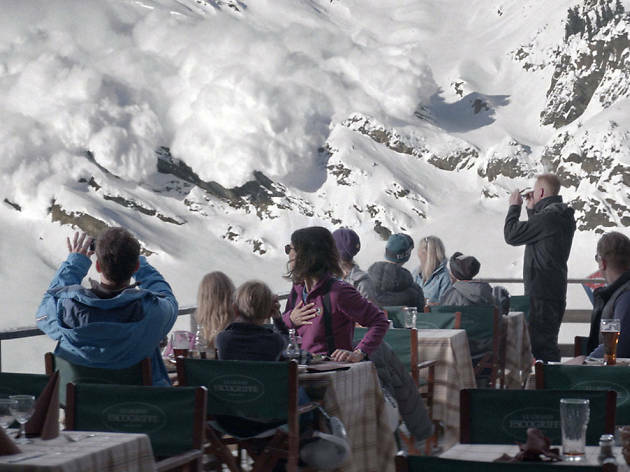 But on that second day, disaster strikes in Ruben Östlund’s remarkably assured and subtle comedy, a film with a delicious sense of unraveling domesticity. A “controlled avalanche” is what the brunchers think they’re witnessing, but when the rumble comes too close for comfort, the crowd panics. When the white cloud lifts, dad Tomas (Johannes Kuhnke) has fled his eggs Benedict, leaving his clan behind. 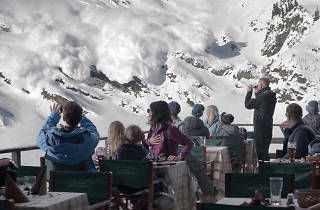 Force Majeure then becomes a wholly different movie, a study in deflated masculinity that echoes 2011’s The Loneliest Planet. Even as Tomas tries to save face—and his buddy (Kristofer Hivju) weakly comes to his defense—something profound has shifted. Ebba (Lisa Loven Kongsli), Tomas’s wife, can barely look at him; the children feel abandoned. The film builds riotously via a series of verbal takedowns as male authority goes limp in the wake of a regrettable impulse. This is slender material to build a whole film around, but Östlund turns it into something deep, for viewers with patience.